Training can be hard work but it also provides a great excuse to get creative with tasty, runner- friendly dinners, such as this vegetarian twist on a classic kedgeree. Traditional kedgeree uses smoked fish. 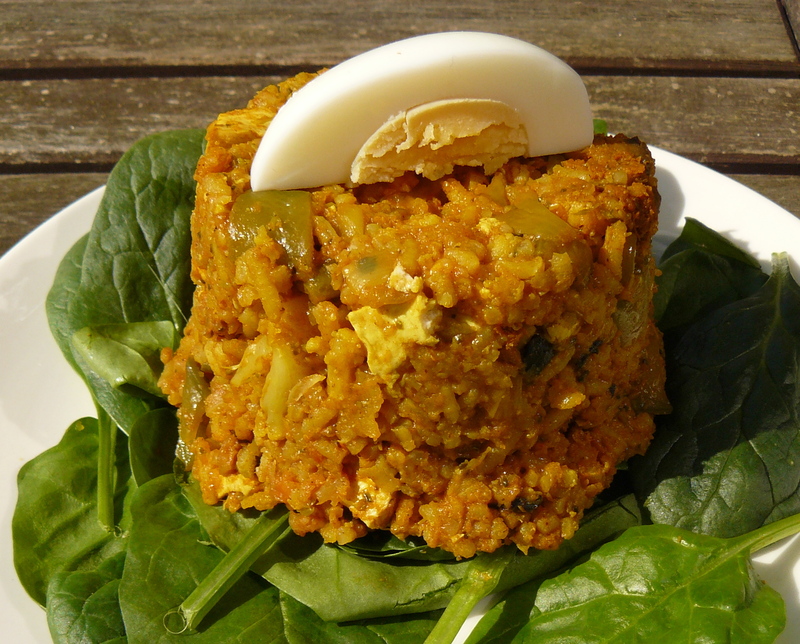 Traditional vegetarian kedgeree doesn’t used smoked anything. Upshot? Vegetarian kedgeree is usually rubbish. Sad but true. Not this time, though! No, no, noooooooooo. We’re always keen to be authentic, even in a dish as inauthentic as this one. Smoked tofu is the thing that gives this kedgeree its kick. That and the curry spices. The tofu is low fat and gives the dish a boost of protein. The kedgeree is also great for carb loading – down with dreary pasta dishes! We’ve done our research and this is easily the most delicious veggie kedgeree ever. At least on this planet anyway. This recipe uses half rice and half ‘riced cauliflower’, a little trick we learned from the fab Scottish vegetarian blog, Tinned Tomatoes. Simply cut cauliflower into florets and buzz in batches in a food processor or with a hand blender until it’s in rice-sized bits. It gives a great depth of flavour; try it! Broccoli would work just as well, though we’re not sure what kind of colour the dish will end up if you use it. Serve with salad or on a bed of raw spinach. It’s good cold too so fab for your lunch box and it makes great little rice patties – make into small balls, flatten and then shallow fry until lightly browned on both sides. First, boil the eggs for 6-8 minutes, according to preference (I like the yolks hard but boil them for 6 minutes if you like them a bit softer). Plunge into cold water to prevent a dark line forming around the yolk. While the eggs are boiling, saute the onion, garlic and ginger in the vegetable oil. Add the curry spices, stir well and cook for 2 minutes. Add the rice and 'riced cauliflower' and stir well. Stir in the tomato puree and tomatoes, then add the vegetable stock. Bring to the boil, stirring occasionally, then reduce the heat to a simmer and cook until almost of the stock is absorbed (about 20 minutes). Keep an eye on it as it's simmering and stir now and again to prevent it sticking. Add the smoked tofu and stir well. By the time the rest of the stock is absorbed, the tofu will be heated through thoroughly. Remove from the heat. Cut the eggs into quarters and stir into the kedgeree, keeping a few quarters aside for garnish.